While listening to Change in the Air through earbuds recently, the sound of Cuong Vu's trumpet took on an amazing quality. In the ballad "All That's Left of Me Is You," he sounded like Bobby Hackett, whose dreamy trumpet floated off in the distance on those classic Jackie Gleason albums on Capitol. Bathed in echo, Vu, like Hackett, conjured wistful thoughts that elevated the lyrics of romantic standards. Instead of a fleet of violins, "All That's Left..." had Bill Frisell doing similar things on the guitar, both accompanying and adding extra melody. One song later, I realized that this sonic experience came about through carelessness. I wasn't hearing the full stereo recording because the earbuds weren't plugged in all the way. Once the jack was fully in place, there was Vu front and center. Not the same aural encounter, but still a great song. 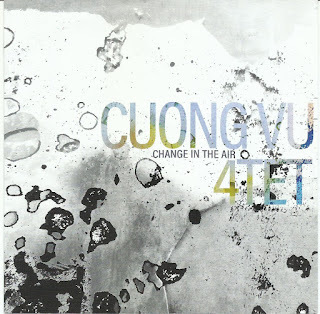 For Change in the Air, Vu had everyone in the 4tet bring in original compositions. Drummer Ted Poor composed the first two tracks, each vastly different. "All That's Left of Me Is You" was written to sound like a ballad from the era in which Hackett was famous, and it contains some familiar harmonic turns. (This could be my ears, but the deep cut Neal Hefti ballad "Falling In Love All Over Again" comes to mind.) Rather than sounding derivative it creates a comfort level, aided a great deal by Frisell's warm sound and Vu's rich tone. Poor also contributed "Alive" which feels like a waltz with a couple extra beats added every few measures. Bassist Luke Bergman holds it down with Frisell while the drummer and trumpet dig into the nuances of it. The loping feeling, and the way Poor plays off of that, add to the excitement which sets high expectations for what might come next. Bergman's "Must Concentrate" begins with some folky guitar strumming and, following some bright tones from Vu, it gets heavier after Poor cues in some power chords. The trumpeter's "Round and Round" and its partner "Round and Round (Back Around)" feature Vu and Frisell locked into a deep rubato conversation that gets more dramatic as melodic phrases repeatedly come back around. Frisell's three pieces also have simple folk-like melodies which benefit from Vu's strong tone and the rhythm section's flexibility. The closing "Far From Here" is a gentle free ballad, combining a high lonesome (or "wistful," perhaps) quality with the open, free feel of Paul Motian, the latter due in large part to the guitar and drums. Albums released under a leader's name typically build on one musician's vision, which is developed by a full band. When all the musicians in a band write for a session, the results can be diverse but a little too eclectic. Change in the Air lands at the ideal spot in between those poles. These 10 tracks offer a varied set that show each player's individuality and the compatibility within the group. 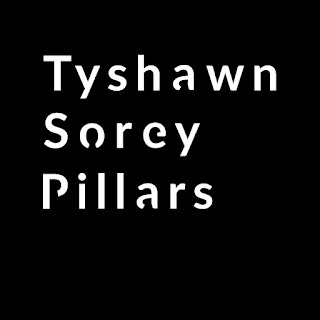 For someone who is both prolific as a composer and in-demand as a sideman (click here for just a sample of proof) Tyshawn Sorey does not rush anything with his own music. This becomes clear in the opening section of Pillars, a single composition spread over three discs. The work begins with a drum roll that lasts nearly four minutes. The roll has no significant shifts in dynamics. Sorey may be toying with phase shifting a little as he plays it, although that could be my ears listening for variations. It's tempting to say this segment sets the tone for what will come over the three discs, each lasting about 75 minutes on average. But that's an easy cliche and it's not an accurate description either. Sorey, who plays drums, percussion, trombone and dungchen (a Tibetan long horn) and conducts, is joined by four bassists - Joe Morris, Carl Testa, Mark Helias and Zach Rowden. Testa doubles on electronics. Morris also plays guitar, as does Todd Neufeld. Stephen Haynes (trumpet, flugelhorn, cornet, alto horn and small percussion) and Ben Gerstein (trombone and melodica) complete the octet. The unsettling moments aren't limited to the shrill pitches either. Part III begins with a repetitive passage, where the basses bow a dissonant tone cluster and a answer comes from a quick guitar plink. This continues for four tense minutes before a trombone enters the fray for a solo that adds some haunting beauty to the scene. On the surface, this section can get under one's skin, but since Sorey takes his time, it encourages close scrutiny to figure out why he did it this way. Only then do you notice how the basses slowly move out of sync with one another, with one beginning to pluck instead of bow. When the trombonist (it could be either Sorey or Gerstein) is left alone, the slow transition makes it feel more dramatic. It's kind of surprising that Pillars doesn't include any notes from the composer. Neufeld plays both acoustic and electric guitars, so it can hard to distinguish the latter from him or Morris. Same goes for the 'bone players, not to mention the bassists, who are panned across the speakers. Besides, a piece like this with so many sections begs from some guidance. Sorey has said the work was inspired by Zen meditation, which explains the deliberate movement of the work. Low notes drone slowly, not creating a melody but setting a mood. They might happen in close proximity to three- or four-way bass passages or they might lead to the tolls of gongs and bells, which always sound rich and enthralling in Sorey's work. In other people's sessions, Sorey has made complex time signature swing as hard as an Art Blakey 4/4 groove. Here, he often reduces his trap work to simple pounds and crashes. But that's really all the music needs at that point. While the subdued movement of the set does evoke the act of meditation, it also recalls work by Roscoe Mitchell (Sorey played on Bells for the South Side) and Bill Dixon. The Part III opening also invites comparisons to Morton Feldman. Ultimately, name dropping all of these composers in one paragraph indicates that Sorey is actually creating a new stream of music which might not have its own category as of yet. 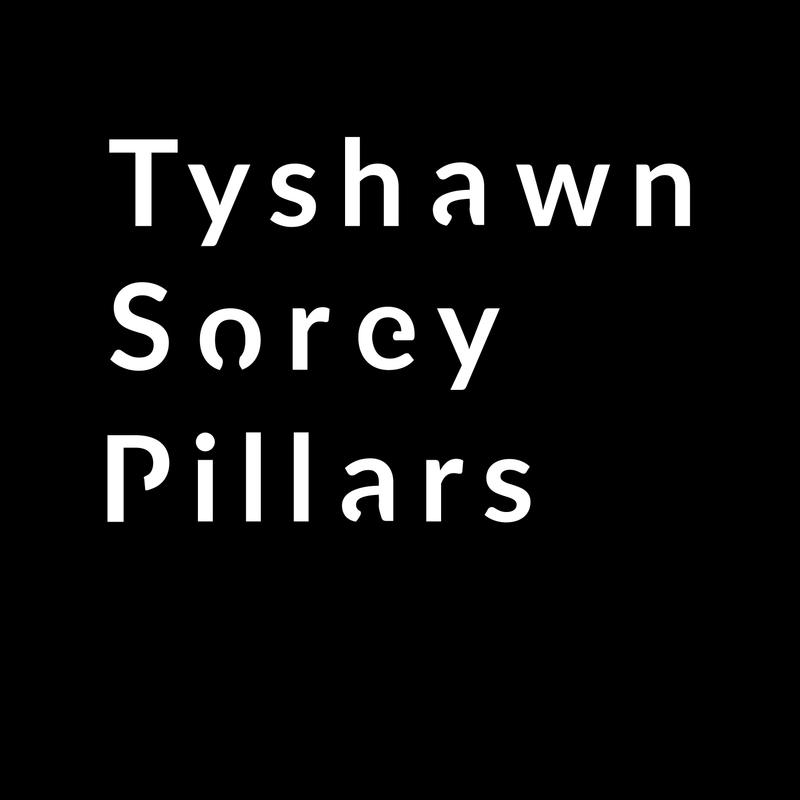 Sorey explains that the flowing quality of Pillars means that shouldn't be considered "goal-oriented music...Actually I see the experience as meditative, akin to how it works with ambient music, so that you're almost 'listening without listening' - a Zen way of experiencing music," he says in the album's press release. In a really surprising turn, Pillars IV, the vinyl counterpart to the three-CD Pillars presents a different version of the piece which surely impacts the way it can come across to listeners. After listening to the discs several times, there is a temptation to discover out how it comes across edited down and delivered on vinyl. After all, Sorey has declared, "To me, the recording is the piece." Lately, the writing assignments for Pittsburgh Current have been coming at such a rate, it almost feels like an actual full-time job. That's not a complaint in the least, but with the real job too, that doesn't leave much focus for things like blog entries. Then when I do have the time, I spent most of wondering if there's something else I should be doing. I turned 51 last weekend (October 7, for anyone who's keeping track) and while I didn't get the full day off from work, at least I didn't have to work the closing shift. After dinner with Mum and the family, I made it to Brillobox to catch the Major Stars, as well as local openers Terry & the Cops. (Dinner precluded getting to see the other opener, Ancient Skvlls [not a typo]). Major Stars are led by guitarists Wayne Rogers and Kate Village. For more background on the band, click here to see my preview on the show. Most bands have their personalities shaped by their singer. Not necessarily the case with Major Stars. Originally Rogers handled the vocals. But once he decided to devote all his attention to his guitar, three women have filled the slot, each bringing a dynamic set of pipes to the band. Noell Dorsey has been the vocalist for a couple years now and she has a voice that can hold its own when combined with the three-guitar onslaught of Rogers, Village and Tom Leonard. When the guitar solos were going - which was a major chunk of the set - she spent a good deal of time doing some impressionistic dancing/swaying to the music or, towards the end of the set, banging on a tambourine. She didn't seem to mind playing second fiddle to the guitars. Some people might run screaming at the idea of three guitars, beaucoup solos and excessive volume. On paper it may seem like a dude thing, in the worst way possible. But Major Stars poked holes in that idea. For obvious starters, there's Village, who came off as the most physical player of the three. Armed with a hollowbody guitar, she ravaged it during the set, leaping offstage (almost colliding into several audience members) and working the feedback through it, with amazing and taste. Rogers also jumped towards us several times, in addition to stalking around the stage like a man with a mission. But he played with a sense of lifting the bandstand, not merely showing off. Leonard, who stayed back comparatively, had the tough task of maintaining himself between these two, and complementing Rogers' lines at times. He pulled that off in spades too. As far as volume, well, you can't have three guitars up there and expect to be polite and quiet. Guitar music of a very different type was happening at Club Cafe this past Saturday. Bill MacKay grew up in Pittsburgh but moved away and calls Chicago his home. A couple years ago I wrote about an album he released with his band Darts and Arrows. More info about his recent work can be found here, in a piece I did for Pittsburgh Current. MacKay took the stage at a show that could have used at least a couple dozen more people. It was just him and an Epiphone, plus a few pedals and a glass slide. Something really peaceful and spellbinding happens when people play music this pure and honest. It's rich in melody, and filled with technique, which probably adds to the quality of it. But MacKay made it look easy to squeeze these harmonic fragments together with a little bit of fret noodling and a lot of focus. The show was so uplifting that the next morning, I took to social media in hopes of getting some friends out to see him play a free show at the Carnegie Library in Oakland. I'm not sure if anyone took me up on the idea of the 2 p.m. show, but one good friend bought some music online based on my tip, so I was glad to hear that. I got there towards the end of a set by the local duo Pairdown, but liked what I heard. Most compelling was "70s Bert," a song inspired by guitarist Bert Jansch and another story about mystery and intrigue (I think), which they delivered with some gorgeous picking that was a direct link to Bert. On the previous night, I was back at Brillobox for the album release by locals Mariage Blanc. (Read all about them here. See, I told you PC has become like a part-time job, rather than just freelance stuff here and there.) I realize I throw the word "dreamy" around quite a bit when talking about pop music, but the way guitarists Matt Ceraso and Josh Kretzmer play together, picking out complementing melodies, did sound pretty dreamy. Having listened intensively to Mirror Phrase, their new album, it was exciting to hear the music coming to life onstage. Not that the album lacks any humanity. But it is produced to sound like a complete work, whereas on Friday, I was watching four guys playing that music. The only frustrating thing was the large contingent of people talking at loud volumes during the set. Unlike Major Stars, Mariage Blanc's music doesn't mow you down so much as pull you in. If you want to talk, people, go downstairs to that bar. You're not doing the band any favors. And you're missing out. Mariage Blanc took what I like to call "the coveted second slot," between openers Andre Costello and the Cool Minors and headliners delicious pastries. I got there late (it was my first night not closing in several days, so I had family time) and I only caught the tail end of Costello's set. By the time delicious pastries went on, I was beat, bur I couldn't leave. These guys hardly ever play out and when they do, they make it Happening, combining the best of vintage psychedelic pop of the past and of the newer strain that comes from bands like Olivia Tremor Control. I caught myself nodding off while standing on my feet, and I still couldn't leave until they were done. Considering this album comes from Delmark, which for decades has championed generations of free improvisers in Chicago, the title of Geof Bradfield's debut on the label gave the impression that this was going to be a session that might get pretty rowdy. Nine improvisers together can create a good ruckus. The opening "Prelude,"where Bradfield's tenor blows over a jerky vamp provided by bassist Clark Sommers and drummer Dana Hall, didn't dispel the preconception either. Things never boil over but Bradfield takes some great intervallic leaps and the rhythm section gradually gets freer. But the ensemble passages in "In Flux," which immediately follows "Prelude," take a different turn. They feature an airy, colorful blend of flute, bass clarinet, trumpets and trombone. Scott Hesse's guitar solos might toy with bar lines, but there isn't a trace of skronk to what he does. Then, if things seem to light, alto saxophonist Greg Ward changes all that in his all-too-brief solo, before one of the trumpets brings it back down. Something else is afoot here. The Yes, and... part of the title is derived from an improvisational game used by the Compass Players. This theater group that originated in 1950s Chicago and has connections to comedy legend Shelley Berman (a personal hero), Second City (a successor) and Sun Ra (who was hired once to improvise behind the actors). In the "Yes...and" game, an actor would improvise a bit and the actor that followed them would use this phrase as a springboard to what they would then say, much like improvisation. Bradfield used this concept for the whole album, which he wrote as a suite. "Prelude" and other short tracks like "Chorale" and "Ostinato" serve as quick breakout pieces for trios of the group. The remaining pieces present the whole group working together. The 14-minute "Anamneses" is the most successful of the longer ones. The ensemble moves in and out, sounding like they're agreeing with the soloists' thoughts. Hall's recurring woodblock hits act like a bonding agent to the setting. Anna Webber's bass flute gives the first section some rich color, followed by bigger dynamics and squawks from Russ Johnson's trumpet. Bradfield wraps it up with solo marked by some gruff vibrato. Games of "Yes...and" probably went in directions that the players never expected. It was built on that sense of the unknown. In that same way, this album has a bit of a random quality that can be both engaging and disjointed. "Impossible Charms" leans closer to modern big band swing, with solos from trombonist Joel Adams and trumpeter Marquis Hill. The album concludes with "Forro Hermeto," a salute to the festive music of Hermeto Pascoal. It's a worthy ending, especially in the final minutes where the rhythm shifts into a highly-charged dance party. But on the basic listening level, it almost seems out of place considering all that has preceded it. At this point, jazz music is open to all manner of composition approaches. 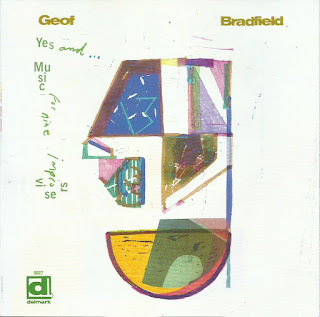 Geof Bradfield has drawn on one from another artform that lends itself to the music. Although the results might be a bit far flung this time around, there are plenty of moments where the soloists and the ensemble passages bring it to life. John Vanderslice Returned to Pittsburgh! As a scrawny kid growing up in the part of Squirrel Hill, a Pittsburgh neighborhood, that bordered the Greenfield neighborhood, there were certain things you watched out for. Well, one thing in particular. If you made eye contact with certain types of dudes from Greenfield, you were likely to get a chest pumped in your face and accusations of "being bad." All because of eye contact. I was once accused of trying to be bad by a tough dude who stole a hat I was wearing. The threat came because I had the audacity to try and grab it back from him. And that didn't even happened on the streets of Greenfield. It was right before a CCD class at church. But that was long ago. Greenfield is a different place now. Not only are those kinds of threats (hopefully) gone, but now there's a chance that a house on Greenfield Avenue might host one of your favorite singers when he plays an intimate set for about 35 people. That's just what happened this past Wednesday, when John Vanderslice set up shop for an evening. I have to admit I had some apprehensions about the set-up. Vanderslice's songs of conspiracy theorists, dark threats, strange love and generally unwound narrators seem to draw people who really like his music a lot. (I fall into that category but my obsession has been in remission as of late.) These Vanderslice fans could be the type of people that consider an intimate living room concert the place where they can have one-on-one conversations with him between songs. These kinds of things happen at indie rock shows, so why not here. Wrong. Wrong. Wrong. The night was nothing like that. Clark, the host of the evening, was a gracious, enthusiastic host, as was his wife, whose name escapes me. (Sorry.) Their daughter Ada had a concession stand on the front porch, which several visitors patronized too. The Living Room Tour solved every problem Vanderslice had with the typical tour grind that can drive indie rock performers crazy. The audience, in exchange, got to get up close and personal with him for a more time than one normally gets at a club show too. For two solid hours, he played 20 songs and told us stories between them. He even opened with "The Dream is Over," a song by his old band MK Ultra, which Clark requested. At first the stories between songs went on as long as the actual songs, with Vanderslice's sharp wit and warmth making them worthwhile. Anyone who thinks that his lyrics are all a reflection of himself as an anxious, paranoid theorist would be relieved to discover how together he actually is. "I'm crazy, but a good crazy," he said. The guitarist continually asked if everyone was comfortable, or if they needed to get a drink. He also plugged Ada's concession stand as well. He even invited questions, which were politely asked about some of the lyrics. After a few songs, John seemed really comfortable with the scene and didn't always stop to talk after every song. "My song-to-story ratio is high," he later said, and he was right. He struck a good balance between songs and talk. So when he needed help remembering the lyrics to "Fiend in a Cloud," it didn't upset the flow of the evening. "Exodus Damage," with lyrics that read like a letter from a co-dependent narrator to either a lover or role model, became even more suspenseful when Vanderslice stopped strumming the guitar and sang most of it a capella. It was even more impressive since he started the song lightheartedly by trying to get Clark's wife (who requested it) to sing it along with him. Vanderslice sang so many songs that night, with vivid tales populated by all sorts of characters, that I felt like I needed to go home and listen to all of his albums, and all the MK Ultra albums, again and remember all the words and song titles. The whole performance got me that excited about it. Afterwards, he urged everyone to hang around for a dance party. "Well, if you have to go, that's okay," he assured us. The party never really took off but after working the merch tables and bestowing genuine thanks to everyone who came, he expounded to us hangers-on about the creativity and production in modern hip hop music, cranking up his Spotify playlist to offer examples. He laid out a whole elaborate set of reasons, but that's better suited for another blog post some other time.